Sea Buckthorn, a plant which produces the orange-colored sea buckthorn berry, grown mainly in the mountainous and colder regions of China, Russia and Canada, is rapidly becoming popular throughout the world for hundreds of potential benefits it provides, both nutritionally and medicinally. Whether taken internally, or applied topically to the skin in oil, lotion or cream form, sea buckthorn is beginning to gain a reputation as a “super fruit” for its ability to both heal and prevent a wide range of illnesses and conditions. The unique therapeutic properties of Sea buckthorn have more than one hundred and ninety biologically active compounds. This number includes six different fat-soluble vitamins and vitamin-like substances, 22 fatty acids, 42 kinds of lipids and 36 kinds of flavonoids and phenols. The most important pharmacological functions attributed to Sea Buckthorn are can nurture the cells in the body and prevent the negative effects of free radicals, postpone the aging process, anti-inflammatory, anti-microbial, and analgesic. • Acne: The anti-inflammatory agents in sea buckthorn, such as quercetin and salycins, together with the immune boosting fatty acids mentioned above, work in harmony to address the 3 main culprits of acne: immune system, hormone imbalances and chronic inflammation. • Anti-aging: Sea buckthorn rich in vitamin A and vitamin E reduce the appearance of wrinkles and retard premature skin maturation. • Chemotherapy: The flavonoids in sea buckthorn help cancer patients recover more quickly from the effects of radiation and chemotherapy treatment. • Cardiovascular benefits: Sea buckthorn is rich in unsaturated fatty acids, including omega-3, omega-6, omega-7 and omega-9 oils, experts believe can significantly help to improve heart health and drastically reduce a person’s risk for heart attacks and strokes. • Cell repair and rejuvenation: Sea buckthorn helps significantly in the repair and rejuvenation of the body’s cellular structure. • Cerebral health: The fatty acids flavonoids and carotenoid found in sea buckthorn not only help reduce the risk of stroke they promote overall brain health and memory. • Cholesterol control: The flavonoids and essential fatty acids in sea buckthorn help to increase the good cholesterol (HDL) in one blood and lower the risk of conditions such as coronary heart disease and stroke. Also, phytosterols reduce the amount of cholesterol that taken during meals. • Fatigue: Sea buckthorn is rich in many valuable vitamins such as vitamin C and vitamin E, and can help reduce some symptoms of fatigue such as low energy and muscle tension. Sea buckthorn even helps develop a more restful night’s sleep. Those who are involved in physical work must include sea buckthorn in one form or the other to restore their energy levels. • Gastrointestinal health: Sea buckthorn seed oil is an effective treatment for gastric ulcers as it normalizes the production of gastric acid and helps to reduce inflammation in the stomach and other gastrointestinal organs. • Hair: The oils and fatty acids contained in sea buckthorn improve overall hair health and lend itself to a healthy and natural-looking shine. In addition, preliminary trials seem to indicate a correlation between the use of sea buckthorn and a reduction in the onset of premature hair loss. • Hypertension or high blood pressure: Sea buckthorn extracts — bark, juice, leaves and oil — are effective in treating high blood pressure. The essential fatty acids help to lower blood pressure, and research suggests that increase flavonoids (which are abundant in sea buckthorn) intake also benefits hypertension. • Immune system: Sea buckthorn rich in vitamin C help, to boost the immune system and fight off infection. • Liver: Clinical trials have shown that sea buckthorn normalize liver enzymes and immune system markers in those with inflammation or cirrhosis of the liver, and help to prevent the harmful effects of various substances high in toxicity. • Menopause: Sea buckthorn is a natural emollient, relieve vaginal dryness that may occur during menopause. • Skin diseases: Studies have shown that sea buckthorn’s ability to treat conditions such as acne, dermatitis, eczema, skin lesions and rosacea. Its skin-healing abilities are due to its high essential fatty acid, flavonoids, protein, and vitamin content. • Sun Block: Sea buckthorn naturally absorbs the sun’s harmful UV rays which can cause skin damage and may lead to skin cancer. • Triglycerides: Sea buckthorn reduces these blood fats that also contribute to heart disease and stroke. • Ulcers: Sea buckthorn improves the health of mucous membranes in the gastrointestinal tract. The seed and pulp of Sea buckthorn oils prevents and eliminate gastric ulcers, possibly because of its phytosterols. • Wound and burn healing and skin rejuvenation: Palmitoleic acid, Sea buckthorn produce fatty acids which is a, naturally occurring substance in the skin. Thus, sea buckthorn has proved highly effective in treating wounds, burns dermatitis and even cancers of the skin. These are just a few of the many nutritional and therapeutic benefits of Sea Buckthorn. 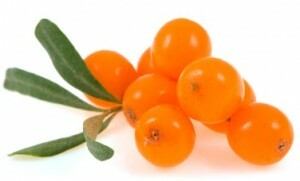 ← What is Sea Buckthorn? I have just picked and cleaned over 2lbs of sea buckthorn berries. I had to fight with the robins to get them. What is the best way to process them or should I out freeze them. I was wondering about a freezer jam using honey? We have lots of trees but the birds beat me to them as I usually leave them for the birds. I enjoyed your article but I do not have a press for the seeds and besides. The berries are beautiful, bright and plump. Yes, we would recommend freezing them as you probably do not have the equipment needed to make oils from them. There are a ton of sea buckthorn berry recipes on Pinterest as well.